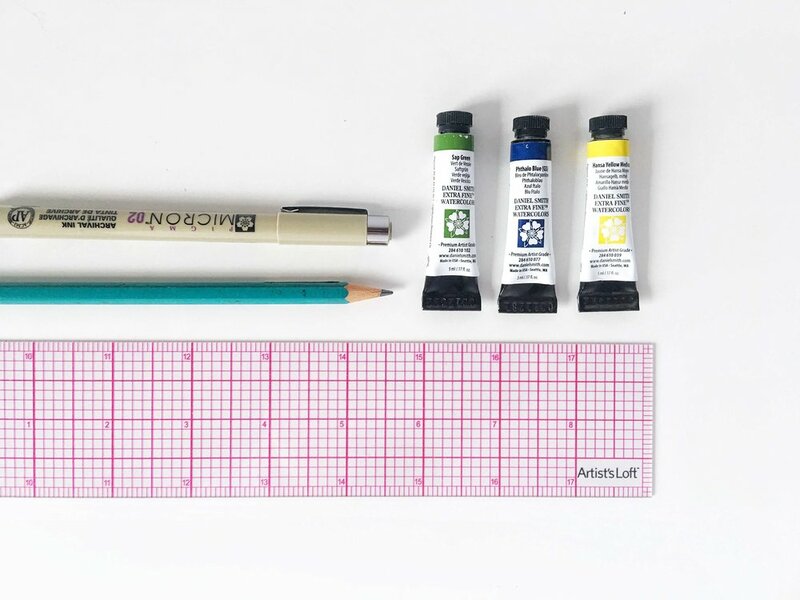 This post is the last part of a series going over 5 types of watercolor charts. If you're just jumping into this series, you can check out the rest of color chart posts here! If you’ve been reading since the beginning of this watercolor chart series, you may have noticed that each chart type is a little more involved than the last. Each one in the series takes a bit more time to paint but also teaches us more about our paints. These last charts are probably the trickiest to paint of the 5 types, but are my favorite because they reveal the most about all the possible colors we can make with our paints. I can’t find anyone that calls them this officially, so unofficially I call these "two color mixing charts" since that’s what they are: charts showing the gradient of colors you get when mixing two colors together. I mentioned in the post about the color mixing charts that even with a chart of 144 colors, there are actually many more possible. The reason being that each square on the color mixing chart (other than the base colors) is only one single result from mixing two colors in equal proportions, 1:1. But there are other proportions to be explored. I'm not great at math so I'm not even going to try explaining this any further - but you get what I mean, right? Basically we can take each mix on our color mixing chart and explore it even further with these two color mixing charts. Best of all, when you paint these, you end up with beautiful gradient color transitions that are just pretty to look at. The format I prefer for these is a similar idea to the color mixing charts. Instead of only painting full value colors for the scale, I like to use this chance to paint two additional swatches of lighter values as well. I can’t take credit for the format of these charts as they are borrowed from Michael Wilcox's cards that I saw in Jane Blundell’s amazing collection of mixing charts. But I’ll give you the dimensions for the boxes I drew and how I mix my colors so you have a starting point for your own! Just a note: Below I use affiliate links share only tools I actually use that I think you might find useful. If you click through and purchase, I earn a small commission with no extra cost to you. The paper I’m using in my example is a 10”x7” which gives you room on the bottom if you want to write any notes or swatch additional colors like Jane Blundell does. I happened to have a 10"x14" sheet that I cut in half, but if you have a 9"x12" sheet that you want to cut to a 9”x6”, the following box dimensions will still fit, the left and right margins just might be a little tight! Draw out 10 boxes across the length of your paper at 3/4” wide and 1” high with 1/8” gaps. Draw two rows of boxes below the first row that are 3/4” wide and 1/2” high using 1/8” gaps as shown. Pick the two colors that you want to study and write the names at either end of the chart. Swatch each color at either end of your chart. I like to start by filling in each end of the chart with the pure colors first. Create 4 puddles of the first color and 4 puddles of the second color on your palette. 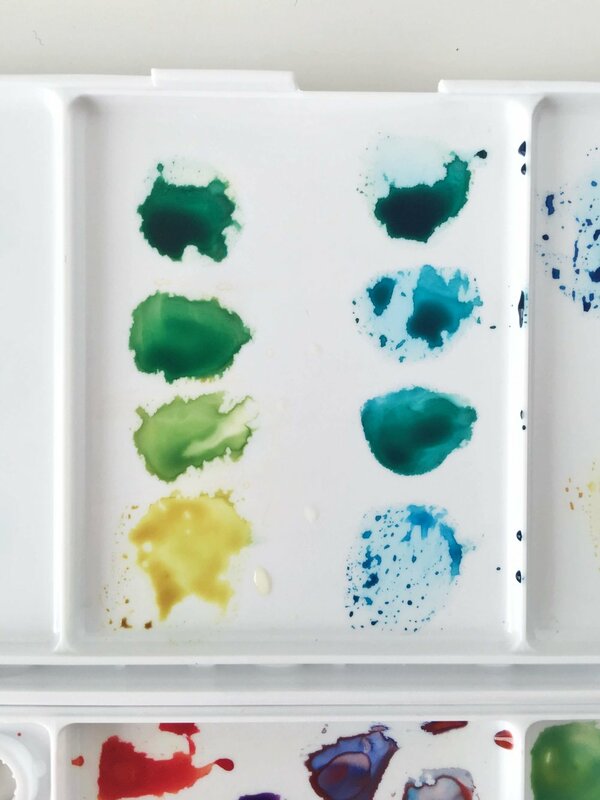 Starting with the 4 puddles of the first color, mix in only the slightest amount of the opposite mixing color into the first puddle. Add a little more of the opposite pigment to your brush and mix-up the second puddle. Repeat for the 3rd and 4th puddle, keeping in mind the proportions you are adding each time. Remember, you have 8 boxes to fill in the transition from one color to another! I’ve made the mistake of adding too much color and ending up way too close to color on the other side! After the fourth puddle, wash your brush and repeat steps 3-5 for the second mixing color. Look at the colors on your palette - do you have 8 distinct colors? If yes, start painting! I like to work from left to right. So, I’d paint the second column using the first puddle that was a mix of the pure color on the left + tiny bit of the color on the right - and so on. Remember to dip your brush and paint the lighter values in rows 2 and 3 of each column before completely washing out your brush, see my method below for getting the two lighter values! Paint the color at its full value, then dip the tip of your brush in your water once, wipe it on the edge and paint the box directly below. Repeat above step so that you have two lighter values of the same color. You will do this for each color of the chart. When you are done. you can take notes on these mixes or even add more to the page like Jane does in her examples. I haven't added any notes or additional studies to mine yet, but I like having the option to do so in the future. I prefer painting either end with the pure paint colors first. I like making puddles ahead of time before mixing in pigment, it helps me see the colors and adjust as needed. I forgot to take a photo before using them to paint, so you can see how some of the puddles were used up. If you want a more simple format for a two color mixing chart, you could skip the additional rows of values and just draw single rows on your paper. See below for an example where I did that in order to compare the color mixes between Quinacridone Rose and two different blues: Phthalo Blue and French Ultramarine. I think you can see how you could spend a lot of time making two color mixing charts with all sorts of combinations of colors. I have these grand plans to paint many more of these in an organized fashion and assemble them in a binder eventually. Thank you so much for following along with this series! Even though I’ve explored these charts and mixed up a lot of colors using the paints I have, I know there is so much more to study! While I don’t think I’ll ever know it all, I always love learning new things so I hope you’ve enjoyed these posts as well!